Starring: Hailee Steinfeld, Haley Lu Richardson, Blake Jenner, Kyra Sedgwick, Woody Harrelson, Hayden Szeto, and more. Movies have so many ways to enter into your interests. You could know of it solely because your favorite actor or actress is in it and naturally, you know mostly all of their projects they are involved in. Likewise, your favorite director or producer may be involved and you are aware of what they are working on. Or maybe you get tipped off to a movie due to a trailer peaking your interest. With my latest review, ‘Edge of Seventeen’ did exactly that. It came into my focus after I saw its trailer placed in front of a previous film I was watching. Now this method can sometimes be dangerous. You could see too much of the movie, the trailer could mislead you, or it could be an over-hyped trailer. Regardless, you play with fire when you are tipped off to a movie through a trailer and here we will see if my interest in a well-done trailer translates to a well received movie through the eyes and words of Oberrated. The fun and glamour of teenage years are far from that when young Nadine (Hailee Steinfeld) goes through the motions of her rough teenage life as she seems to hit consistent bad luck as her days pass. Life takes a turn for the worst when her best friend gets into a relationship with her brother and Nadine is left to figure out how to go on with her rough life on her own with seemingly no one to fall back on. So, from first look, this film has a chance to be seen as childish or the plot could be seen that way as well, but fear not, this film is rated R and for good reason. 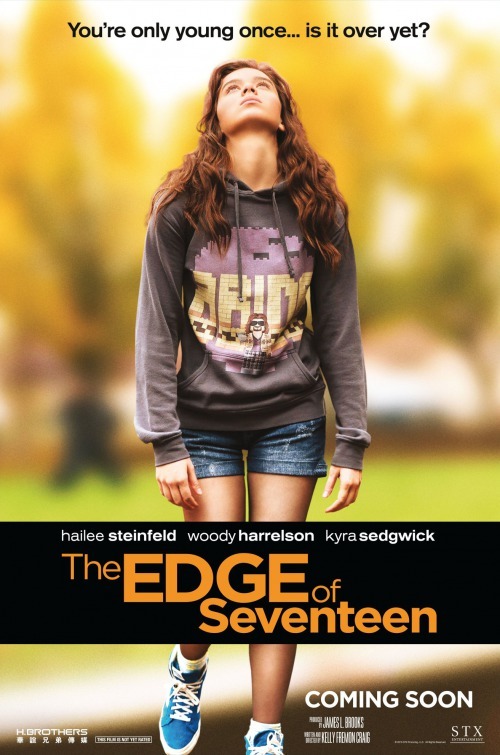 With plenty of language, crude jokes, and a realistic look on how high school aged individuals interact, the movie easily appeals to the 17 and up aged movie goers… ‘Edge of Seventeen’ was a breath of fresh air to me. It was a change of pace from the stereotypical teenage drama. What I liked most was how real it felt. The struggle of a growing young adult with a not so great of a life. With problems that seem giant to herself but extend way farther than meets the eye. An excellent story that was flawlessly executed… Speaking of execution, I was overall astounded by everyone’s performance. I wish to see every one of these actors and actresses in future movies because I thoroughly enjoyed everyone incredibly much to their own respect… The humor in this film is a very dry, one-liner, quick quipped humor. In the trailer, this film could be quickly slated as a constant comedy with consistent one-liners but it was far from that. I, myself, expected that but was fine with being wrong. It had its moments where it seemed to be drawn out at times but regardless, there are plenty of moments that had me laughing in my seat and even an occasional long-lasting one. Overall, ‘Edge of Seventeen’ was a very well done film, strongly performed, and refreshing to watch. It is a drama with a story to be told. A real story that many teenagers to young adults deal with. Definitely worth the watch and definitely one to remember. Posted in 2016 Movies, Movie Review, Uncategorized.